The first book in my Supper Club series, The Saturday Night Supper Club, came about because I was undergoing what I like to call “home study culinary school.” Armed with textbooks and gastronomy books, I was determined to turn myself into a real cook, not just someone who could follow a recipe. My discoveries made their way into my writing life, and a series was born. 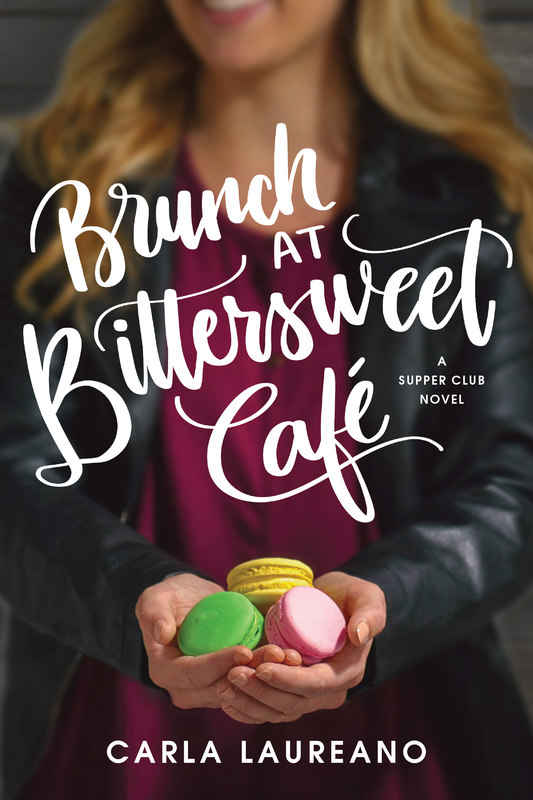 The second book, Brunch at Bittersweet Café, came along a lot more naturally: I’ve been an obsessive baker since, well, birth, so it wasn’t a stretch to write a pastry chef with nostalgic ties to her grandmother’s recipes. In the course of a lifetime of baking, the last twelve of those spent living at about six thousand feet above sea level, I’ve learned just as much about myself as I have about the science of baking. Lesson #1: Most problems don’t come from a lack of ability; they come from a lack of planning. With the exception of macarons, which at my altitude seem to require a mixture of black magic and pixie dust to perfect, baking isn’t all that hard. After all, the interaction of ingredients is fairly predictable, and if you’re working off a decent recipe, you can be more or less assured of the finished product. The problems come in when you don’t read the recipe through and prepare your ingredients in advance. Who hasn’t discovered halfway through that they’re missing cream of tartar or some other obscure ingredient you were sure was hidden in your pantry? And while some recipes are forgiving of a quick trip to the store, others are completely ruined by your lack of planning. I’ve found that to be a surprisingly apt comparison to life. Most of us are capable of more than we think; we simply need to learn to plan ahead, take our time, and not leap into situations before we’ve thought them through. Lesson #2: Problems are just a matter of perspective. Going back to the macaron reference, I have only ever made one perfect batch of macarons, the result of several failed batches and minuscule tweaks recorded faithfully in my notebook. Recently, I wanted to make a batch and after searching high and low, determined that I must have accidentally thrown away or given away that notebook when I was whittling down my cookbook collection. Worse yet, the website from which I got the original recipe is permanently gone. I had to start over from a brand-new recipe. Flat, gooey, stuck-to-the-mat macarons. Besides learning a) to be more careful when I’m cleaning and b) not to use that recipe again, I found that even the biggest disaster can be salvaged with the right perspective. They might not have been macarons, but made with copious amounts of almond flour, sugar, egg whites, and cocoa, they were still absolutely delicious. I called them chocolate almond chews and ate them with a nice cup of coffee. My problem was turned into an afternoon snack. Sometimes all we need is a shift in perspective and that failure doesn’t look so bad after all. Click to download a full-size version. Lesson #3: There’s no disaster that can’t be fixed with a little chocolate. This one is pretty self-explanatory, but I’ll elaborate anyway. I made a batch of Girl Scout Thin Mint clones on Christmas Eve. Because it was a paleo recipe, the dough was a little fussy and a good portion of the cookies I cut out cracked or broke apart. I pieced them back together on the baking sheet, sealed the cracks the best I could, and hoped for the best. Let’s just say that when you’re having a really bad day and just need to get to the finish line, there’s no shame in smoothing over the cracks by hiding in your closet with a Hershey bar. Lesson #4: Sometimes you have to cut your losses and start over. Before I learned I was gluten intolerant, I was a huge bread baker. People are scared of homemade bread because they think it’s difficult, but the long process of mixing, kneading, and rising is actually pretty forgiving with lots of chances to fix what’s going wrong. However, I did have one recipe using some alternative flours that must have been misprinted, because I couldn’t get the ingredients mixed to anything approximating a dough: it was shaggy and lumpy and it wouldn’t come together. Adding more water only made it slimy; adding more flour made it grainy. After struggling with it for half an hour, I finally turned the contents of the bowl out in the trash. It pained me to waste the expensive ingredients, but at that point, I could tell there was no salvaging the recipe. Why throw good time after bad money? Sometimes in life, despite your best efforts, you can’t salvage a situation. Maybe it’s a job that didn’t work out, a friendship that has gone from being supportive to toxic, or just a recipe gone wrong. If you’ve given it your best effort, there’s no shame in calling it quits. Sometimes the bigger waste is sticking it out when you know the outcome is never going to change. Lesson #5: When all else fails, turn to the professionals. I consider myself a pretty good baker, but there are just times when the recipe doesn’t come together, my power goes out in the middle of a bake, or I run out of time to finish what I intended. That’s when I go straight to the professionals: my local bakery. Sure, I might have wanted to present something home-baked, but there are times when the outcome is more important than the process. The older I get, the more I realize that it’s okay not to do everything yourself. Some things, like taxes and hair color, I believe are best left to professionals. Other things can be great to DIY, but they just don’t fall within my priorities. I might be able to occasionally send a plate of homemade chocolate chip cookies to a school party, but I was never going to be like the preschool mom who, on snack day, brought an entire tray of beautifully iced sugar cookies with each child’s name piped in script across the center. Most of the time, store-bought and boxed was going to have to be good enough. Just because you can doesn’t mean you always must. Now it’s your turn! Tell me, what life lessons have you learned from your own culinary adventures? 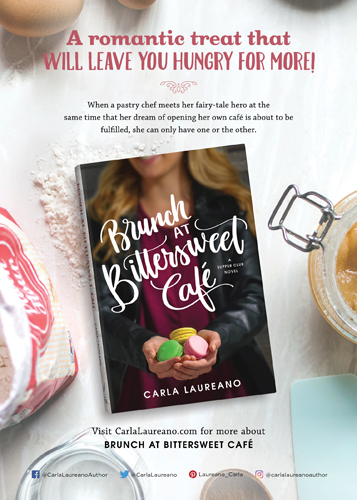 Carla Laureano is the RITA Award–winning author of contemporary inspirational romance and Celtic fantasy (as C. E. Laureano). A graduate of Pepperdine University, she worked as a sales and marketing executive for nearly a decade before leaving corporate life behind to write fiction full-time. Carla! I started reading it on the plane and am loving the book! Yay! Makes you hungry, doesn't it? For some reason, every book of Carla's I read at some point made me hungry. Lol. Interesting, Carla. Also ironic: I'm leaving in about an hour to decorate and pack Valentine cookies for police, fire and shut-ins with our women's group. I've never been able to make bread and my pie crusts aren't great, but I do okay on cookies, squares and bars. Writing IS like baking, or like laundry: you've got to know when to fold. These are good lessons not only for writing, but for life. We lived in Colorado Springs for four years. I did okay after I learned to adapt my recipes. Also used a High Altitude cookbook. That's awesome of you! Here's my secret--I can do bread and pie crusts, but my cookies at high altitude are still not all that great. I'm a constant fiddler... I change the recipe every time. I recently sold my high altitude cookbook because I was so disappointed in it! Kathy, pie crusts are something I've never been able to master either. Now that I've accepted that, I simply use the Pillsbury refrigerated crusts and have lowered my stress level immensely. Hi Carla! Alas, I did not get the genetic markers for enjoying cooking or baking. My mother is an excellent baker and a good cook (although she doesn't enjoy cooking as much as baking), and I am neither. That gene definitely skipped me!!!! Love the book cover! It's making me hungry! Fortunately, we all got the genes for eating everyone else's treats. :) Glad you love the book cover! Thanks! Hi Carla. I used to love baking but now that I'm an empty-nester I don't do it a lot. Fun post and I totally get it. What a great analogy. Your books look wonderful and make me hungry! Thanks, Cindy! Hope you enjoy the book! I don't blame you for not baking much... that would mean you'd have to eat them all yourself and that could get out of hand fast! Hi Cindy! There are plenty of great bakers all around. I have a few favorites in the area too, so I get it. Carla, I love baking/cooking. It's often a sort of therapy for me. So this series sounds right up my alley. Time to make a visit to Amazon. A woman after my own heart! I think you'll find it inspirational. :) The series came out of my determination to make myself an excellent cook, not just an excellent recipe follower. I still use them, I just don't necessarily need them! I love cooking more than baking. Cooking can definitely be therapeutic for me too! Carla, welcome! I loved this post! I can so relate to the cooking mistakes. My worst mistake seems to always be discovering I don't have all the ingredients. I'm a recipe and cookbook collector and a wanna-be chef. I've taken one cooking class and loved it! And my husband just bought me a gift certificate for another class for my birthday in January. I really should try to use my love of cooking in my writing! I'm so glad you shared with us today! Thanks, Missy! I'm glad to find another cookbook collector. Though I recently downsized my collection significantly to my favorite 40. That should tell you how many I actually had! I've been wanting to take a pastry class at the local cooking school, but sadly, discovered I'm intolerant of gluten! Until they have a gluten-free one, I'm afraid I would just be torturing myself. OOoo! More food in books is perfect! Life's lessons? Hmmm? Yours are all so good...and so true. I had to learn that I can't do it all, which you mentioned as well. Maybe my cooking analogy would include an expansive menu that needs more prep and cooking time than I have on that particular day. Thanks for being with us today. Care for a store bought, gluten-free chocolate chip cookie? I will absolutely take the chocolate chip cookie, thanks! Experimenting is definitely harder with baking, though I'm currently adapting some old favorites to be paleo, which is basically nothing but experimentation. But at least it's delicious experimentation... I'm making some meringue cookies today, I think, which are already gluten-free. FUN! I love stir fry dishes anytime! If the picky eaters are small ones, have hope...they do expand their horizons if you keep trying! I'm surprised at what my 9yo will try now. But baking...yes, I've always been more of a baker until recently. I enjoy making pies. There is something therapeutic about making my own crust and making it pretty. I didn't like doing it at first, but the more I did it, the more I came to love it. I think this is true in life. Sometimes difficult things are...difficult until we do it enough to where it is not so difficult. Profound! Snort! I'm impressed. Until a couple of years ago, pie crusts were my nemesis. You know what turned it all around for me, though? A good pre-marked silicone baking mat for rolling out my dough. So much easier to size it and then get it into the plate! I no longer hated pie crust once I got it for Christmas. NICE! Pies are always so pretty! I had to take that sign down, and bake less for health reasons, but I still find baking therapeutic. And I learned that just because you baked it from scratch, you don't have to eat it. I suppose that might apply to life in some way? I'll have to think about that. I've found the teacher's lounge at school is always appreciative of the leftovers! I really like your name, "Laureano", which seems to be an Italianized version of the Latin word for "Award winner." Given the first line in your bio, that names seem very apropos. I love baking but I'd never want to be a chef because I wouldn't eat most of the things they make on those cooking shows. I wouldn't even want to taste them! But baking: "tutto è delizioso". What I learned from baking is: have all the ingredients pre-measured and set out in little glass bowls. No looking for or measuring out things when time in baking is so often critical. Preheat everything even the pans you are going bake your popovers in. Put back up and clean everything as soon after you use it as possible so you don't have this big discouraging mess when you are finished. When possible watch it done on YouTube by three different cooks before you try a recipe for the first time. Very important: learn more than one way to how to tell when the baking is finished. The time between overdone and underdone can often be cruelly short in baking! I'm very interested in your books. I've read many of the Goldy Schulz Catering Mysteries by Diane Mott Davidson and the baking trilogy by Sandra Byrd, "French Twist," about going to a top French baking school near Paris. That's more like West Point than baking! Please place me in the drawing. Hi Vince! Sweet! I didn't know that about Carla's last name. That is pretty cool. Thanks for sharing. Hi Vince! The last name is actually Portugese, thanks to my husband (technically his grandfather, who married into a Filipino family), but you are absolutely right about the Latin roots. You definitely seem like serious baker... I think you might like the book in that case! Thanks for stopping by. I love baking and like cooking. As far as life lessons go sometimes following the directions works (most of the time) but sometimes trying it a different way can be amazing and fulfilling! I can't wait to read your book. I LOVED the setting in the other two of yours I read, it was such a treat! Nice Emilee! Love it. Thank you! Thanks for the kind words, Emilee! You're so welcome! Love the cover too! Great post. I find the best-tasting desserts and recipes usually come from the biggest messes. Either that, or I just don't know how to bake without making a mess! Ha! Can you actually bake without making a mess? :D If so, I'm no good at it! Hhahaha.Hot mess is good, isn't it? Lucky you! And great lessons! Oh, it's definitely showed me how little patience I have! Thanks for stopping by. It's great to see life lessons in our everyday activities, isn't it? Hi Carla, I enjoyed reading about your cooking experiences. 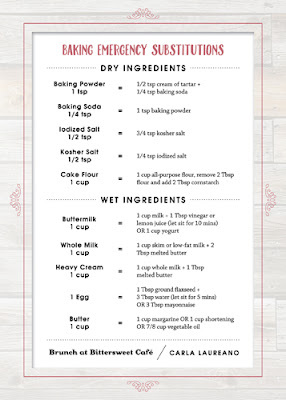 I have learned that there are some recipes that best used when you have plenty of time; some recipes that should never be adapted so that you can save calories and some recipes don't always have to remain just the way that your mom or grandmother always made them. Case in point for the latter: Macaroni and cheese was always baked when I was growing up. This took time and it also required a hot oven even in summer. The first year of my married life I witnessed an older and more experienced cook melting the cheese, milk and butter on top of the stove, adding the cooked macaroni to the pan and then bringing it to the table WITHOUT baking it. Now, in this day and time, this might seem old hat because of the pre-packaged macaroni and cheese mixes but this was long before these were on the market. And as much as I love pies with homemade crust and meringue, I often resort to purchased crusts and Cool Whip or Whipped Cream for the topping. Are these refused because I didn't prepare them as Mom and Grandmother did? What do you think? I hope to read your book very soon. Blessings! What a fun post! 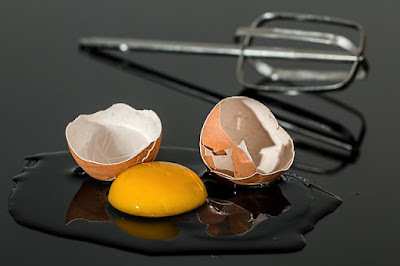 I've learned a few lessons that cover both my cooking and my writing...the first is "This is going to get messy." and the second is "There's nothing that can't be cleaned up later." I tend to cook with every pot, bowl, spoon, and kitchen towel I own. Afterwards I have a grand cleanup. When I am writing, I need to remember to give myself permission to make a mess and get it on the page. I can always clean it up later. What a great post, Carla! As I read about going to the store for a forgotten ingredient and the impact this can have on a recipe, I had to grin. I was making ten (yes, 10) pies for a fundraiser last November when my pastry blender broke. Completely fell apart. I had to go buy another one. Thankfully, I was just working on streusel topping so nothing was harmed. I've found that, when I've made a certain recipe a number of times, there's a flow and a rhythm to preparing it. In writing, as I get into a story, and I work on it regularly, I find my flow for that story, and that always feels good. I loved all your real life applications and the recipes you mentioned sound so good. That's a really good analogy, Jeanne! There's definitely some parallels there. I just got home from work and then I went to the gym so first chance I have had to look at Seekerville today. I haven't even been able to read it yet but it looks good and I definitely plan to read it. I wanted to check in though and have my name put in the drawing. Thanks, Sandy! Good luck in the drawing! I've learned that no matter what life throws at me I can always find something food-wise that I can go to. Even with all my health issues I've been learning how to eat better to heal my body instead of hurting it. It changes everything! You know I relate to all your food issues, Abby... sometimes I miss being able to cook/eat my own things, but all the work comes in handy now when I have to reinvent old favorite recipes!